Apple, finally threatened by one “not recommended” on iPhone 4 smartphone rating by Consumer Report due to bad antenna design causing reception signal drop issue, decided to call a press conference on July 16, 2010 to tacitly acknowledge the iPhone 4 is an imperfect phone. For iPhone 4 owners, the major disappointment after the news is that, though the hardware of iPhone is defective, and Apple won’t recall it. Instead, Apple announced that it will offer a free Bumper case or third-party case to each and every iPhone 4 customers. The free case may be originally the accessory that sold by Apple, or sourced from third-party manufacturers, just to make customers happy, and hopefully alleviate antenna issue by covering the exposed antenna. The inclusion of third-party cases is due to Apple unable to fill the huge quantity demand of the bumper cases to more than 3 millions iPhone 4 sold, though Steve Jobs beautified it as giving Apple’s customers a choice. The free cases will be given to all iPhone 4 sold through September 30, 2010 worldwide. For people who already bought a bumper case from Apple, refund will be given. However, if you were buying third-party cases, then no refund will be provided, although you can order another free case from Apple for your iPhone 4. Apple fanboys and fangirls who already purchased the iPhone 4 have 30 days to return the phone, if they’re not satisfied with iPhone 4, for a full refund, with no restocking fee charged. Before the event, Apple had stubbornly refused to give away free bumper case to fix the poor antenna design on external casing causing lost signal when touched issue, with a leaked internal document allegedly instructed AppleCare staffs to say nothing about possibility of free bumper cases. Apple rejects outright the antennagate notion that iPhone 4 antenna design which places antenna on external casing causes wireless reception issue on iPhone 4, although time and again, end-users have proved that a single finger covering the “beautiful line” spot on the edge of stainless steel ring on the phone that insulates between antennas will cause the cell reception signal to drop or even lost. Instead, Apple blames “grip of death” symptom that common to most mobile phones, although all other phones, except iPhone 4, cannot be made to lose wireless cell signal with single finger touch. 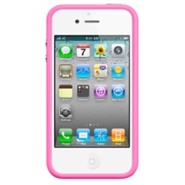 As of now, the Bumper for case for iPhone 4, all colors of black, pink, white, blue, green, and orange, which originally costs $29.00, has been pulled from Apple store and is no longer offered for sale. The listing of Bumper cases is still there, but the price of the Bumper case is now reset to $0.00. However, one cannot order the case where shipping status is currently unavailable. Details on how to order a free Bumper or third-party case will be made available soon. One advise though, if you plan to retain your iPhone 4, and want the free official iPhone 4 Bumper case from Apple, be quick when the order is opened, as Steve Jobs has mentioned that there won’t be enough Bumpers for every iPhone 4 customers. But the smarter choice is probably to return the “imperfect” iPhone 4, and get the probably redesigned “perfect” iPhone 4 which likely to arrive after September 30, 2010, the date free Bumper or case offer expires. Or, probably, wait for next version of iPhone 5. Update: Order opens for the free iPhone 4 Bumper case.